The company sent its Disclosure Form for the BoD & the shareholders' structure for the period ended 31/03/2019, according to Article 30 of the Listing Rules. Release from the company on the launch of a new batch of confectionery products & the signing of an agreement for the acquisition of Confindel LTD shares in Edita Confectionery Industries which is 22.7% worth EGP 55 million to increase its contribution to 99.98%. Content : Referring to the posted news entitled, "Edita Negotiates to Acquire USD 35 Million from IFC," an explanatory release was issued by the company. Content : Corporate Governance Report for the year ended on 31/12/2018. Release from Edita Food Industries on the company's expansion plan for 2019. The company sent its Disclosure Form for the BoD & the shareholders' structure for the period ended 31/12/2018 according to Article 30 of the Listing Rules. Release from the company concerning the Executive Managers. Release from the company concerning the financial results for the period ended 30/09/2018. Content : The company sent its Disclosure Form for the BoD & the shareholders' structure for the period ended 30/09/2018 according to Article 30 of the Listing Rules. Release from Edita Food Industries regarding the company's insiders. Content : The company sent its Disclosure Form for the BoD & the shareholders' structure for the period ended 30/06/2018 according to Article 30 of the Listing Rules. Release was sent concerning the Board of Directors & the Executive Managers. Release stating that the client\ Quantum Investment BV purchased 50,775,403 shares of Edita Food Industries S.A.E, thus the percentage of its contribution reaches 40% of the company's shares. Release stating that the client\ Berco Limited sold 50,775,403 shares of Edita Food Industries S.A.E, thus the percentage of its contribution reaches 1.815% of the company's shares. Statement from FRA stating that the Authority has agreed to exclude Quantum Investment BV from making a tender offer for the purchase of 50,775,403 shares at a rate of 7%, supplementing 40% of the shares of Edita Food Industries S.A.E, owned by Berco Limited. Release from the company regarding the signing of a partnership agreement with DISLOG GROUP in the Kingdom of Morocco to establish snack food factory in Morocco. Release from the company regarding the proposed appropriation account for the fiscal year ended 31/12/2017. Release from the company regarding the AGM to be held on 27/03/2018. The Board of Directors' decisions held on 26/02/2018. The financial results report for the period ended on 31/12/2017. Release from the company concerning the Board of Directors & the Executive Managers. Edita Food Industries S.A.E sent its earnings release for the financial period ended on 31/03/2017. The Board of Directors' decisions held on 10/05/2017. Content : Release from Edita Food Industries S.A.E regarding a trading deal of 239,369,757 shares of the company's shares (representing 33% of the the company's total issued capital as well as the voting rights) from the seller/ Berco Limited to the buyer/ Quantum Investment BV to restructure the group of related parties. Content : Release stating that the client\ Quantum Investment BV has purchased 239,369,757 shares of Edita Food Industries S.A.E, thus the percentage of its contribution reaches 33% of the company's shares. Content : Release stating that the client\ Berco Limited sold 239,369,757 shares of Edita Food Industries S.A.E, thus the percentage of its contribution reaches 8.815% of the company's shares. The company sent its Disclosure Form for the BoD & the shareholders' structure for the period ended 31/03/2017, according to Article 30 of the Listing Rules. Release stating that the client\ AFRICA SAMBA BV sold 26,495,424 shares of Edita Food Industries S.A.E, thus the percentage of its contribution reaches zero% of the company's shares. Content : The company sent its Disclosure Form for the BoD & the shareholders' structure for the period ended 31/12/2016, according to Article 30 of the Listing Rules. Content : Release stating that the client/ Kingsway Fund - Frontier Consumer Franchises purchased 199.600 GDR's of Edita Food Industries S.A.E shares, thus the percentage of its contribution reaches 5.18% of the company's shares. Content: Referring to the announcement posted on 24/10/2016, a release was sent regarding the sugar stocks in company's Factories and the resume of work in the factories. Content : Release from Edita Food Industries announces the suspension of operations temporarily in Beni Suef factory. Content : The company sent its Disclosure Form for the BoD & the shareholders' structure for the period ended 30/09/2016, according to Article 30 of the Listing Rules. Content: Release from Edita Food Industries regarding getting a medium-term loan in an amount of EGP 170 Million, & a medium-term loan in an amount of EUR 6 Million. Content: The Board of Directors' decisions held on 26/09/2016. Content: Release from the company concerning the Board of Directors & the Executive Managers. Content: Release from the company stating the appointment of a Mr. Sameh Naguib Magdy Mikhail head of the financial sector of the company. Content: The Board of Directors' decisions held on 08/08/2016. Content : Edita Food Industries S.A.E sent its earnings release for the financial period ended on 30/06/2016. Content: Release from Edita Food Industries regarding the purchase of a new piece of land in the industrial zone - Polaris Al Zamil - 6th of October City, with a total area of 12.878 square meters and a cost of EGP 19 million. Content: The Board of Directors' decisions held on 26/07/2016. Content : The company sent its Disclosure Form for the BoD & the shareholders' structure for the period ended 30/06/2016, according to Article 30 of the Listing Rules. Content: Release was sent concerning the disclosure form according to Article 29 of the Listing Rules. Content : Release stating that the client/ Africa Samba BV sold 50,742,857 shares of "Edita Food Industries S.A.E", thus the percentage of its contribution reaches 8% of the company's shares. Content : The Board of Directors' decisions held on 11/05/2016. Content : Edita Food Industries sent its earnings release for the financial period ended on 03/31/2016. Content: Release from the company concerning the stock dividends. Content : The company sent its Disclosure Form for the BoD & the shareholders' structure for the period ended 31/03/2016, according to Article 30 of the Listing Rules. Content : Release from the company concerning the Board of Directors & the Executive Managers. Content : AGM And EGM Decisions. Content : Edita Food Industries S.A.E sent its earnings release for the year ended 31/12/2015. Content : Release from the company concerning the call for AGM & EGM to be held on 30/03/2016. Content : The Listing committee held on 09/03/2016 decided to approve the publishing of the disclosure form regarding the issued and paid capital increase. Content : Referring to the Board of Directors' decision held on 02/03/2016 and posted on the trading screens on 03/03/2016, the company submitted the disclosure form. Content : Edita Food Industries sent a release stating the investment cost for its latest factory in 6th of October City. Content : Release from the company concerning the company's investor relations officer. Content : Release from the company concerning the resignation of Mrs. Dina Fikri Sonbaty - Head of Investor Relations Sector. Content : The company sent its Disclosure Form for the BoD & the shareholders' structure for the period ended 30/09/2015 according to Article 30 of the Listing Rules. Worth mentioning that all information included in this form is according to company's responsibility. Content : Edita Food Industries sent a release concerning its Board of Directors' report for the period ended 30/6/2015. Content : Edita Food Industries sent a release concerning its earnings for the period ended 30/6/2015. Content : The Board of Directors' decisions held on 28/7/2015. Content : Release from the company stating that the company purchased a land for industrial use in 6th of October City with a total value EGP 54 million. Content : Edita Food Industries sent a release concerning its Board of Directors' report for the period ended 31/3/2015. Content : Edita Food Industries sent a release concerning its earnings for the period ended 31/3/2015. Content : The Listing Committee held on 13/5/2015 decided to impose EGP 25000 penalty on Edita Food Industries as the company didn't comply with Article (32) & (34) from the listing rules. Content: Edita Food Industries sent a release stating that according to the Board of Directors' meeting held on 14/4/2015, Mr. Hany Barzy, Chairman and Managing Director, has signed two contracts with Hostess Brands LLC. 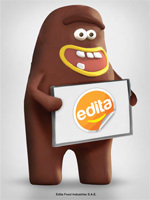 Content : All the disclosure forms received from Edita Food Industries. Content: Edita Food Industries sent a release concerning the coverage ratio of the private subscription. Content : EGX Listing Committee held on 11/3/2015 decided to announce the company's prospectus, report of the independent financial consultant as well as the approval of the financial auditor. Decision of the Listing Committee held on 04/02/2015 concerning announcing the form about the company's projects, management, previous accomplishments and governance policies. Content : The Board of Directors' meeting minutes held on 24/12/2014 (after certification). The Listing Committee held on 26/11/2014 has approved to list the shares of Edita Food Industries S.A.E. The company?s issued capital is LE 72,536,290 distributed over 362,681,450 shares at a par value of LE 0.2 per share. Shares of the company will be added to EGX database starting 11/12/2014 trading session.